Tonight I went to the Apps for Good awards. 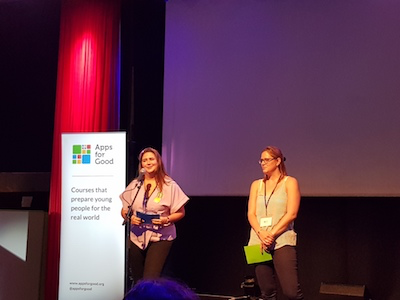 Apps for Good is a free programme which provides courses that schools can include in their curriculum covering app development, Internet of Things and, next year, machine learning. The programme also has a network of experts who can share their expertise with the children through Skype calls, and help develop the ideas. What I love about this programme is the way it helps to build the children’s confidence, and to develop and pitch their ideas. It was a busy evening and the children worked really hard explaining their ideas repeatedly to interested attendees. The awards were presented by senior figures in the tech industry, more than one of whom predicted that these children are leaders of the future, and I’m inclined to agree. Rewardo - from an amazing group of year 5 students with excellent pitching skills. Rewardo allows you to earn outdoor family activities; I liked that the reward was itself focused on benefiting the family. 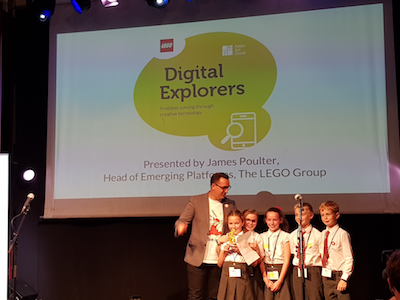 When they won the Digital Explorer’s awards there were tears of joy and hugs from their teachers. REnlightenment - great idea for promoting shared understanding; an augmented reality app which you point at the religious shape (cross/minaret/…) and it tells you about that religion. With quizzes. Hi School was developed by a group to help those for whom English isn’t their first language in school; pairs you up with a learning buddy. imagitale encourages young readers to engage with fairy tales by including themselves in the story through photos and recordings. I received a very confident pitch from Raees while I was walking between stands. Kognition is a system that helps students who find it difficult to ask or answer questions in class do so via an app. The app also allows teachers to track how the students are feeling through the lesson with a Red-Amber-Green traffic light system. Light Bike was the winner in the Emerging Tech category for an enhanced bike to help you stay safe and visible while cycling. The attached LEDs turn red when the bike it braking. 2016 finalists Donate it won this year’s Legacy Award for their continuing work on their app, which allows you to share your unwanted items with charities so they can discover what’s available in their area. I chatted with one of the Fellows, who was a previous award winner and is now involved with judging the awards. His excitement at still being involved was palpable. He’s applying to university, and has a very strong story to add to his personal statement. If you work in the tech industry, you can share your experience by becoming an expert. If you’re a head or ICT teacher, the team at Apps for Good are happy to provide guidance on delivering the course. And it really is free for non-fee paying UK schools. It is available to schools outside the UK too. And if you’re a parent, please mention it to your school. Your children will gain so much from it.